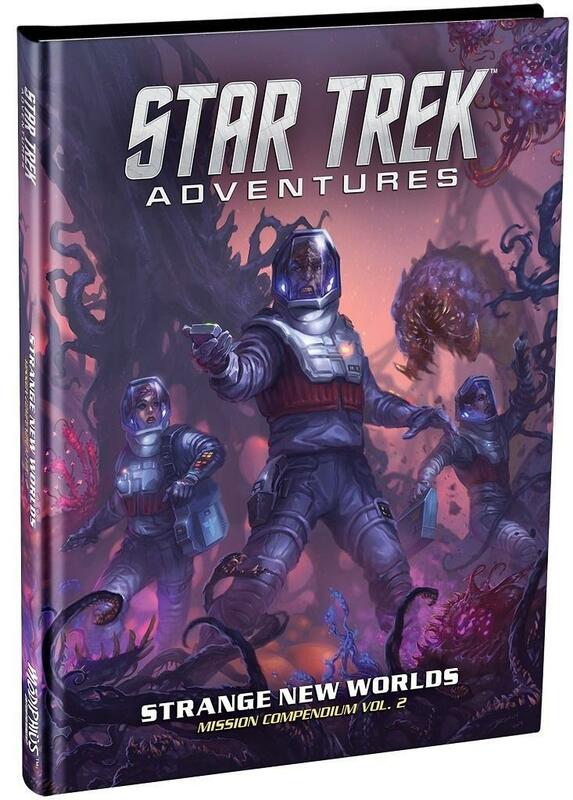 Modiphius Entertainment will expand the Star Trek Adventures Tabletop RPG line with the previously announced The Sciences Division supplement and Alpha Quadrant sourcebook, as well as the newly announced missions book Strange New Worlds in 2019. The Sciences Division supplement will complete the three-part series of supplements giving players and gamemasters insight into the three Starfleet divisions: command, operations, and sciences. The Sciences Division supplement offers players details on the sciences division, including the science and medical departments, Starfleet Exploratory Division, Starfleet Science, and Starfleet Medical. The book also includes information and advice on including the nigh-omnipotent Q in Star Trek Adventures campaigns. The book also offers new options for science-based characters, science and medical equipment not previously covered by the game, and new rules for Gamemasters for creating truly alien beings made of energy or different elements, as well as rules for diseases. The book also has non-player character statistics for significant scientist characters from Star Trek Lore, including Carol Marcus, Noonian Soong, and Zefram Cochrane. The Sciences Division hardcover supplement is priced at $34.99 USD. The book releases in print and PDF on February 19th. 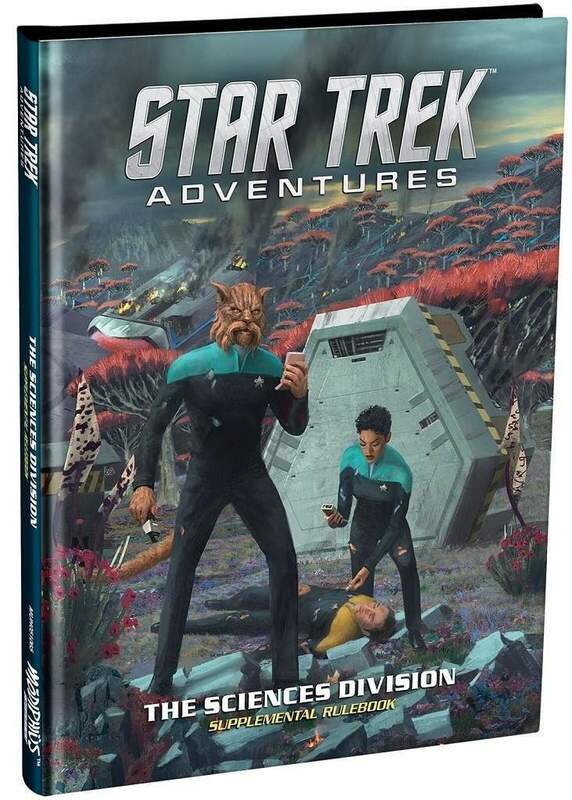 The Alpha Quadrant sourcebook is the second quadrant sourcebook for Star Trek Adventures following the Beta Quadrant sourcebook released last year. The Alpha Quadrant sourcebook focuses on starbase Deep Space 9, the Cardassian Union, the Ferengi Alliance, and the Maquis. The book’s cover artwork visualizes the first battle of Deep Space 9, with the station defending itself from the Klingon fleet. 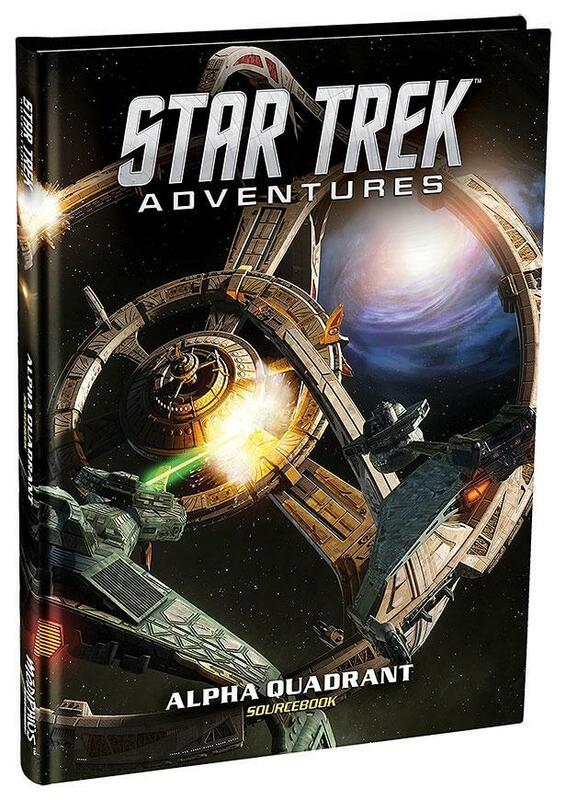 The hints that Star Trek Adventures may be expanding to cover more of the franchise’s timeline as these new books are released. The Alpha Quadrant sourcebook releases in July. The freshly announced Strange New Worlds is the second mission compendium following These Are the Voyages. The book contains 10 original missions ready to play. The missions explore some of the strangest and most challenging away missions on dangerous planets and weird environments that Star Trek can offer. The book features material from both Star Trek fiction writers like Christopher L. Bennett (The Captain’s Oath, Greater Than the Sum) and roleplaying game veterans like Jason Bulmahn (Pathfinder). Strange New Worlds releases in August. Star Trek Adventures is the ENnie award-winning Star Trek RPG that uses the Modiphius 2d20 System, designed by Jay Little (Star Wars: Edge of the Empire, X-Wing Miniatures Game) and developed by Nathan Dowdell (Black Crusade, Only War, Mutant Chronicles 3rd Edition, Conan: Adventures in an Age Undreamed Of, Infinity The Roleplaying Game). The game allows players to form their own Starfleet crew and voyage where no one has gone before. Are you looking forward to these new Star Trek Adventures releases? Let us know in the comments!